Tecumseh Town Council is going to be asked to consider the expansion of Town Hall. enhancements. This has resulted in all offices, meeting rooms and workstations now being occupied including a portable office trailer being placed on site last year for staff work space. 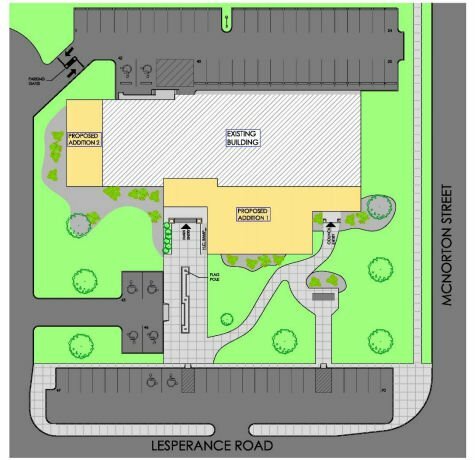 The proposed $3.15m expansion would include a new 5,300 sq. ft. addition to the front of the existing Town Hall for the Financial and Corporate Services departments with a new customer service counter and expanded lobby. A new 1,700 sq. ft. addition would also be built at the south end of the building for the Town’s Environmental Services department and office space for the Director Recreation Services. Council will also be presented with an option to demolish the current building and build a new Town Hall. That would cost an estimated $7,428,739. Town council meets on February 26th.